I'm a BIG fan of most cook shows, celebrity chefs, cook books and food magazines. I love reading and collecting food recipes and try not to miss out any food articles from the Herald Sun newspapers. There is the taste section on every Tuesday, Jamie Oliver section on every Saturday, Guy Grossi section and the magazine insert featuring Donna Hay on every Sunday. As I was reading a blog post from Technicolor Kitchen featuring a banana cake, the name "Jamie Oliver" in her post caught my attention instantly. Patricia (Technicolor Kitchen) said that this banana cake tasted good and I was keen to bake this cake too. Here is the cake. 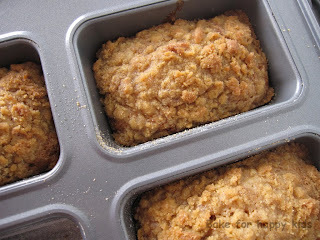 Instead of making a square pan size, I've made them into 10 mini loaves. 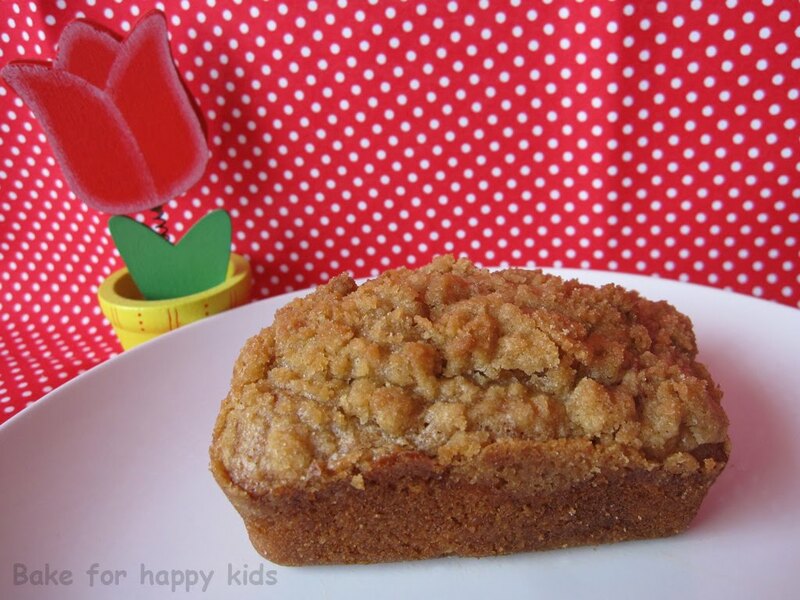 The soft crunch of the streusel gave the cake a sweet melting buttery taste. It has a balance amount of fat and sugar contents that made the texture just right. Being typical health-conscious, my husband think that the cake would be better if it is less sweeter. I agree with his suggestion and will reduced the sugar contents slightly if I would make this cake again. Here's the recipe from Technicolor Kitchen. Center a rack in the oven and preheat the oven to 180°C. Butter a 20cm square pan then flour the pan, tapping out excess flour. Have all the ingredients in room temperature. In the bowl of an electric mixer fitted with the paddle attachment beat together the butter and sugar on medium-low speed until fluffy, 2-3 minutes. Add the egg and beat until completely incorporated. Add the banana mixture and beat until combined. Reduce the mixer to its lowest speed and gradually add the flour mixture, beating just until incorporated. Spoon the batter into the prepared pan and smooth the surface with a rubber spatula. 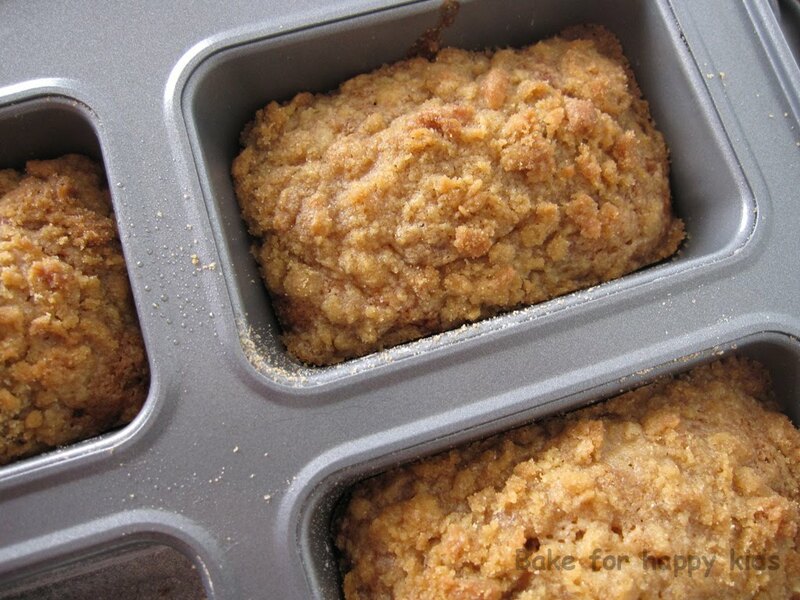 Sprinkle the streusel evenly over the batter. looks delicious, I love the topping. I love it that you liked the recipe, but that is not Jamie Oliver's - it's Flo Braker's recipe. I love Jamie but I do not trust his baking recipes so much.